In years past very little attention was paid to indoor air quality. The Environmental Protection Agency now ranks indoor air quality as one of the top three health concerns in the country. Pollutants such as pollen, bacteria, viruses, dust mites and mold are inside of most homes. Van Drunen Heating does not simply provide you air that’s comfortable to live in; we provide air that is comfortable to breathe in. How much time do you spend in your home? The air in your home is 3 to 6 times dirtier than the air outside. A one inch wide slide-in filter on your ductwork is designed to protect your equipment, not to clean your home. If you are using the more expensive 3M, True Blue or Filtrete filters you are probably restricting too much air and are compromising the performance of your furnace and air conditioner. Due to the limited amount of surface area in one inch filters, we recommend you purchase the cheaper one dollar free flowing filters, keeping in mind these filters do not improve the indoor air quality of your home. How much time and money does your family spend on doctor visits, medications, sleepless nights and unproductive hours due to health issues? We can access your situation and give recommendations improving your indoor air quality. You may want to consider the Lennox Healthy Climate HC16 which consumer reports rates as the number one filter. We handle the Pure Air whole home air purification system. The Pure Air cleans the air in your home better than any other single system you can buy. 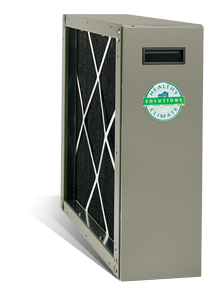 We also handle the Healthy Climate HEPA filtration system which has a 99.97% efficiency rating. Add an Aprilaire automatic self-adjusting humidifier and your dry skin and throat will be gone through the winter months.